Augusta – where two oceans meet! 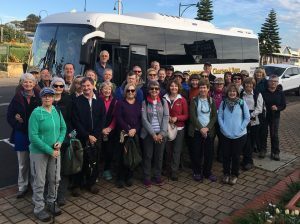 Welcome – We met at the Augusta Hotel on Friday night for a pub meal and a noisy chin-wag, excited to see each other and full of anticipation for the weekend ahead. 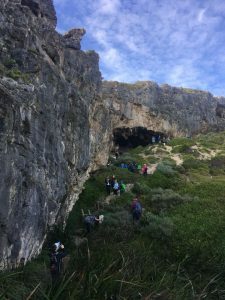 Saturday – free choice – Some decided to descend into the depths of a very challenging cave tour, others walked the picturesque 7kms ‘ocean walk’, while Christine and Jenny walked the entire 12kms distance to the Cape Leeuwin Lighthouse (Colin and Graeme came to the rescue and collected them in the car). Saturday night – dinner at Hamelin Bay Winery was tapas style, delivered platter by platter. We started to think that we might be going home hungry! As the night progressed and eleven platters later, there was no way we would go home hungry! The wine was excellent and somehow cartons of it found their way into the boots of our cars. Our amazing group laughed and joked their way through the evening. 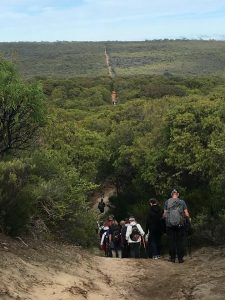 Sunday – another section of the Cape to Cape Trail. We have of course repeated some walks on this trail but overall, our tally is a total of 97kms! 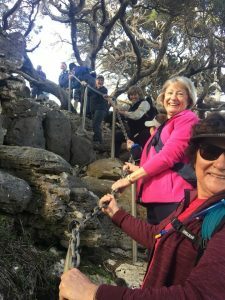 The Cape to Cape trail is only 131kms long, so it is a great achievement by Y Striders. The long walk is perfectly described by Nancy W……. “An awesome day! 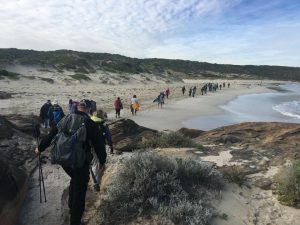 A group of 38 Y Striders walking a 15km section of the Cape to Cape trail enjoying the majesty of our amazing landscape on WA’s celebratory long weekend. Photographically, clouds wrote poetry across an expansive sky, the sea whipped waves, ancient grass trees; tall and graceful in their Ra-ra skirts, wowed and later, tall Karri canopied our way. 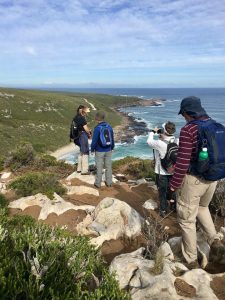 From Redgate Beach to Conto’s Campground and into the Boranup Forest, the diversity in terrain was wonderful. We walked in friendship and delight, thankful for this awesome day”. Sunday night – farewell BBQ and debrief in Turners Caravan Park camp kitchen followed by a Karaoke hour (or two) in one of the apartments. This singalong and performance by Chris B and Brian P was the culmination of yet another successful June weekend. 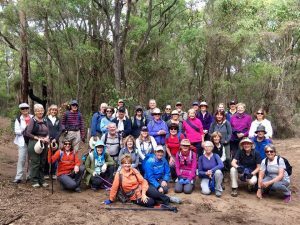 Monday stayers – First there was a HIIT session at 6am and then lunch at the Glenarty Road Kerfuffle Winery. Twenty people enjoyed a ‘Paddock to Plate’ experience in a rustic setting where they like to do things a little differently. The Beef Ragu was amazing! Many of us intend returning there again. Late Leavers on Tuesday – The last of the group trickled out of Augusta in a wild storm that thrashed the south west coast. Care had to be taken negotiating trees that had fallen across the road. It all came together beautifully! From Bill’s lightbulb moment, “I think that Augusta might be nice,” to months of organisation before finally spending three days of celebration in the most south western town of our state. None of this could have happened without the combined effort of six people who conducted the original reconnaissance in September last year and who were all on hand on the weekend to ensure that everything went smoothly. It started with a weekend of investigation in Augusta – accommodation, eating places, activities and actually walking the proposed trails. I want to thank Graeme G, who researched the accommodation and provided you with a well-informed selection to choose from. Graeme also organised the Cave Tour, the bus transport for the long walk and assisted me in my research into eating establishments. I want to thank Pam, Kevin and Bill for finding just the right walk that was suitable for everyone, for providing us with comprehensive walk notes, and Darryl for driving them to and from each of their destinations over two days of research. On the day of the long walk, it was Kevin and Bill who took control of the lead and the tail end so that no one got lost. And then there were our resident musicians! I want to thank Chris B and Brian P who provided a wonderful Karaoke music night, complete with all the associated paraphernalia for Karaoke – a computer, screen, microphone, guitars and a spaghetti junction of criss-crossing wires. I would also like to thank Ross and Colin who generously drove their vehicles back and forth with the people who only wanted to do the short walk. Without their help, some people would not have been able to participate. But best of all, the success of the weekend can be measured by the enthusiasm of the 42 people who participated in all of the activities. Thank you everyone! Thanks Elizabeth. You have put together a lovely recollection of the weekend. Our thanks to you and Darryl also, for organising for us to use the camp kitchen and barbecues at Turner’s Cara Park – it worked really well, we thought. AND, your tireless and comprehensive ‘behind the scenes’ work is very much appreciated too.